You’ve heard about them in the news. Charismatic Ponzi schemers target thousands of gullible or inexperienced investors, then rob them of millions. Despite warnings, many people continue to fall for Ponzi schemes. 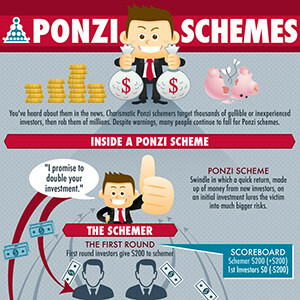 A Ponzi Scheme is a swindle in which a quick return, made up of money from new investors, on an initial investment lures the victim into much bigger risks. Then the schemer has no new money to pay off investors. Loss to “investors”: $20 million, 6 banks closed doors. Mr. Ponzi– for which the scheme is named– promised clients a 50% profit within 45 days, or a 100% profit within 90 days. His business plan involved buying discounted postal reply coupons in other countries and redeeming them for face value in the US. In reality he was paying himself and early investors with the money from later investors. So that’s how they work, so why do we keep on falling for them? Mr. Madoff survived 6 failed SEC investigations over at least 20 years of Ponzi scheming. Madoff deposited investor money into a Chase account, when investors wanted their money, he would return their money or the money of other clients to them. Some clients came out ahead, while others lost everything. Of the $36 billion invested in the scam, $18 billion was returned, and $18 billion was missing. Mr. Kelly sold two types of investments: a nine-month promissory note, and a so-called “universal lease.” Using investor money to buy cars, houses, and hotels, Kelly offered investors the option to use hotel rooms, rent rooms, or allow third-party managers to use the room. The third option gave annual returns up to 11%. Using 25 year terms on investments, Kelly was able to pay back investors for a time. Loss to investors: $300 million to 1000 individuals, $150 million to banks. This swindler was the cousin of Art Garfunkel and the one time manager of the Backstreet Boys, N’Sync and LFO. He also used a company that only existed on paper–Transcontinental Airline Travel Services– to swindle investors out of hundreds of millions of dollars. When word of the scam surfaced, Mr. Pearlman went on the run, but was eventually spotted by savvy tourists at a luxury hotel in Indonesia. Promises little or no risk. Remember that you’re the customer, and it’s your financial adviser’s responsibility to honestly and clearly explain your investments. If it sounds like it’s too good to be true, it probably is.